I am writing this on my day off on Sunday as I watch the leaves blowing crazily off the trees outside my living room window. We have put the clocks back this morning and there is a definite Autumnal feel in the air. I love this time of year: I love the colours, I love Halloween, Bonfire Night, Christmas madness, being all wrapped up warm. We are waiting for the Great Storm Jude to arrive so the remaining leaves on the trees are not likely to be there for much longer! In terms of foodie yumminess it has been a mixed week. 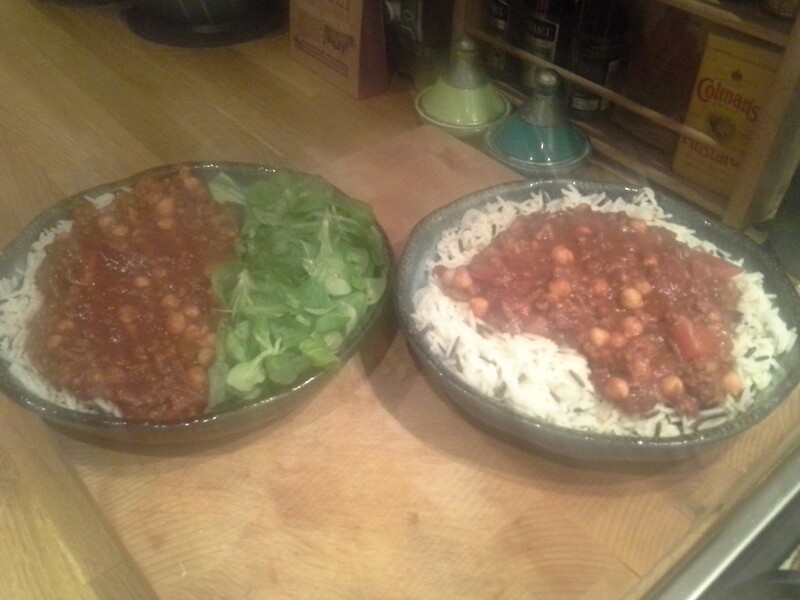 It started with a chilli made by Colin which was…. not good… but not Colin’s fault. 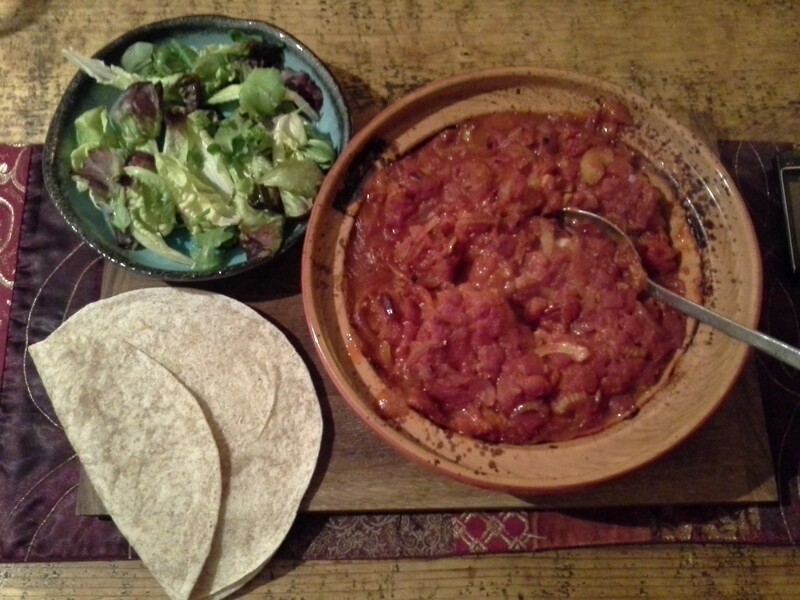 I had bought a new chilli mix which made the chilli really gloopy, like it had a load of flour into thicken the sauce. We don’t really like thickened sauces as we prefer a more natural tasting sauce and we simply have more veggies to soak up the juices, and this definitely spoilt what would have been a good chilli I am certain. 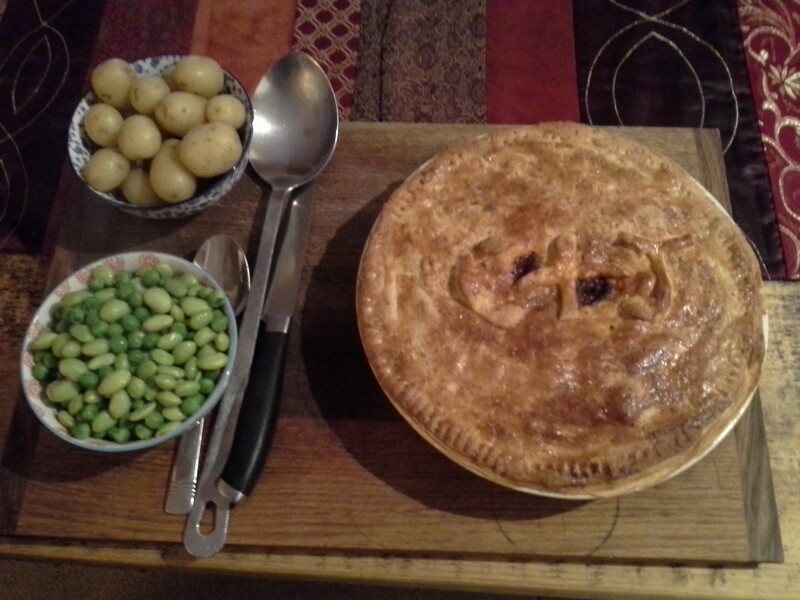 Wednesday saw better food as I made a pie! …you can just about make out the C&J on the top! I had intended to make a shepherds pie but forgot to buy some more potatoes for the mash topping. Remembering that I had a piece of puff pastry in the freezer I adjusted the plan and made a shepherds pie filling with a puff pastry top. The only change I really made was that the veggies in the pie- parsnip, carrots, suede- were chopped alot more chunkily than I normally make them, and I cooked the mixture down until nice and thick before covering it with it’s pastry lid. Lovely on a dark evening. 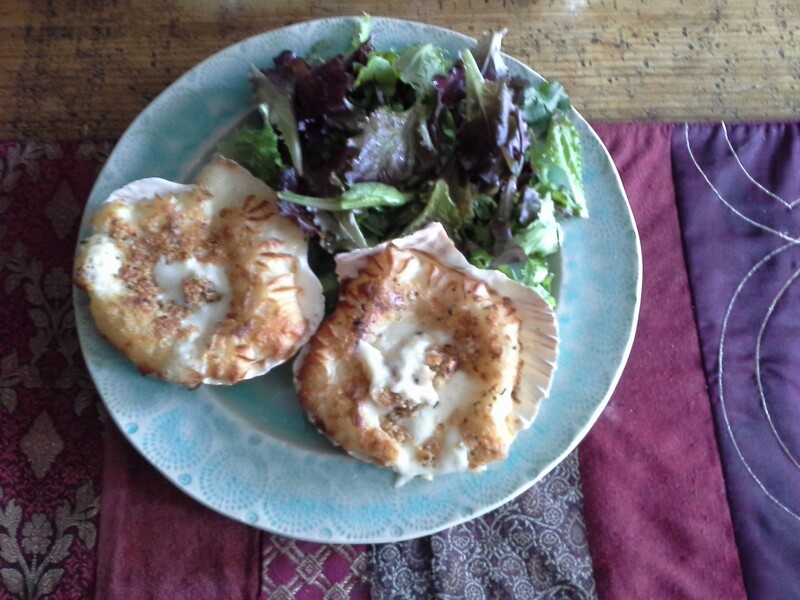 Thursday was my day off and I fancied something a little decadent so I popped into M&S and bought some coquilles St Jacques for my lunch- I felt a little naughty tucking into this for my mid week lunch with a cheeky glass of Italian white. 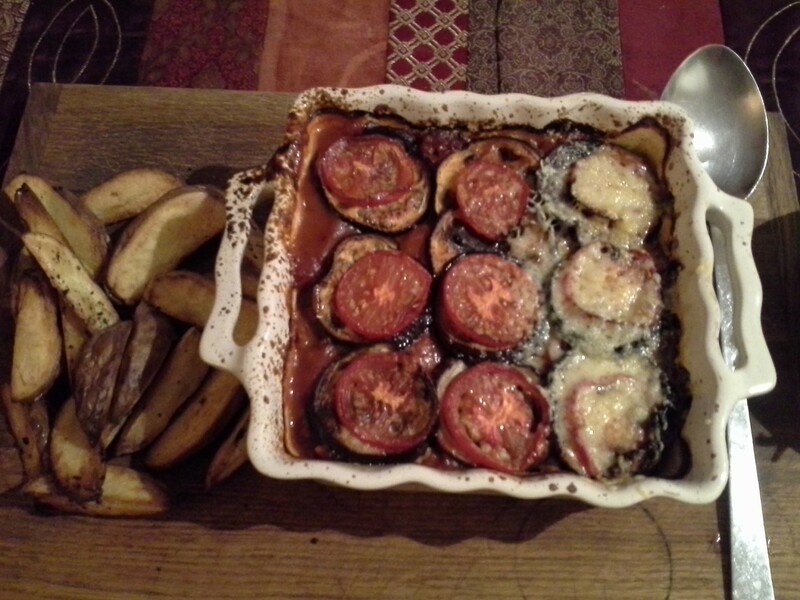 For dinner I will call this ‘like a moussaka’. I grated over some parmesan with 5 mins cooking time in the oven left. You will see that the cheese is only on part of the bake- despite Colin becoming alot more adventurous he can still not abide melted (yummy) cheese! Being my day off I indulged myself in the afternoon with a browse through my cook books. I came across a recipe in my favourite book- Food of the Sun, Alastair Little- that I had not tried before. Here’s my version. Fry the potato chunks in some olive oil until crispy. In a separate pan fry the onions until softened. Add the chilli and the spices and season, before adding the tomatoes and simmering until reduced and thick. 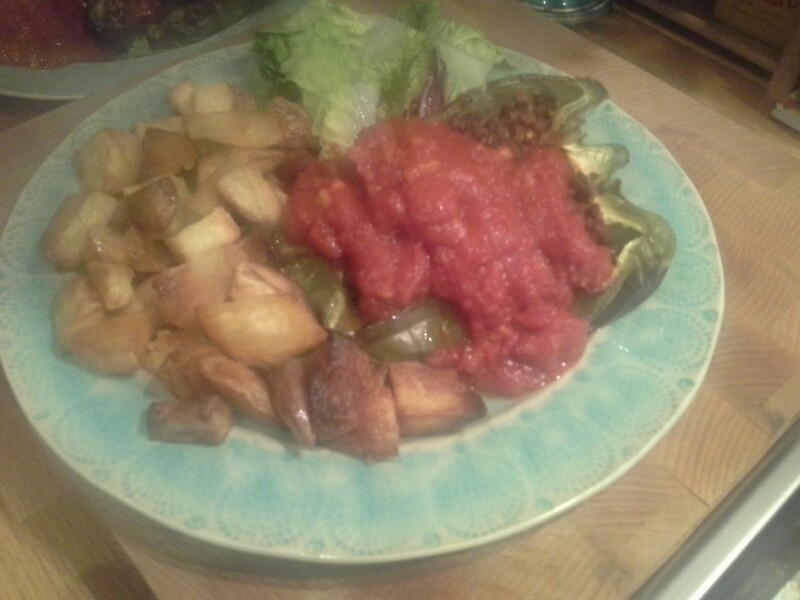 In a tagine or a deep baking dish add the potatoes and place the fish on top. Cover with the tomato sauce, pop on the top and bake in the oven for about 30/45 mins. 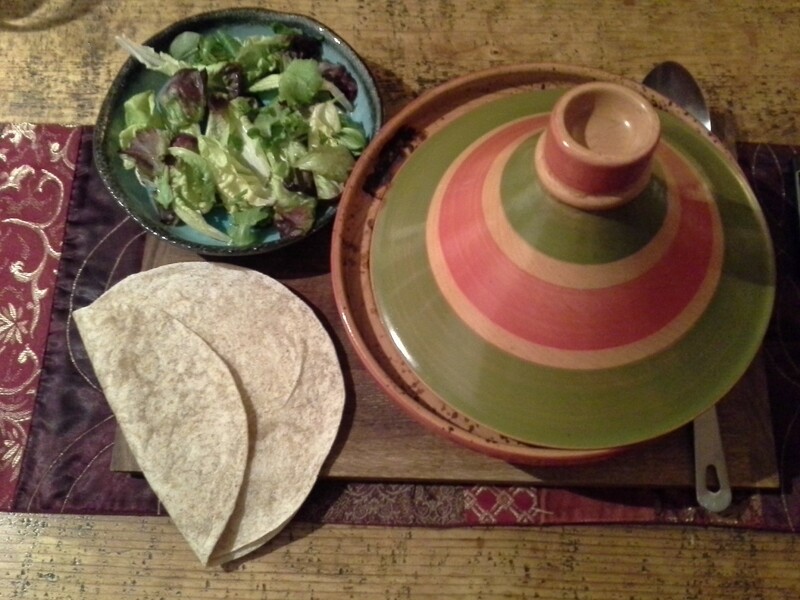 Eat with some flatbreads, potatoes, rice, couscous, or even pasta! Really yummy- and no surprise from the best cookbook ever. We had not managed to get a day off together since we were in Italy so we had been looking forward to this weekend off together for what seems like ages!!! With grey and miserable weather forecasted I filled the car with food and wine on my journey back from work on Friday night so we could lock the door and not venture out if we didn’t fancy it. 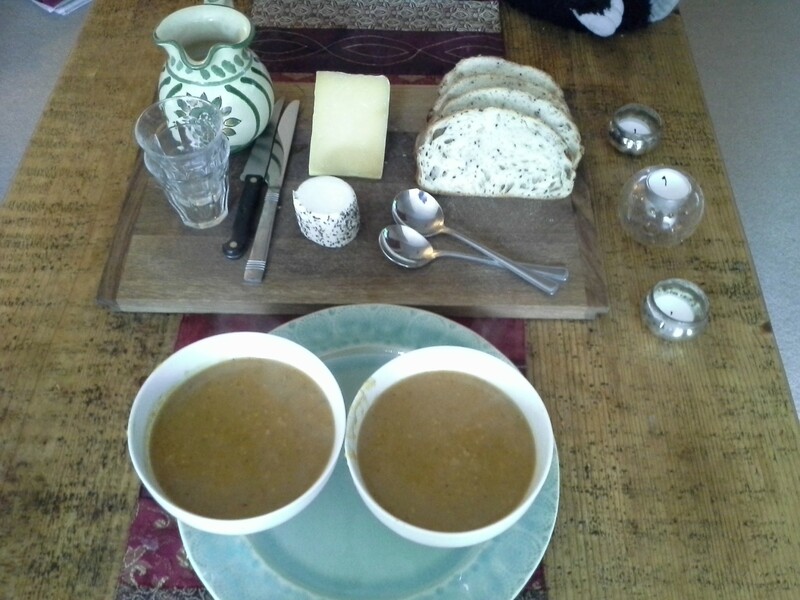 Roasted Butternut Squash and Sweet Potato Soup (homemade) with Rosemary and Potato Bread (shop bought!). This soup was really lovely, warming and homely, and easy to make on a lazy Saturday morning. I chopped the squash and sweet potato and popped it on a baking sheet with some seasoning and some za’taar. After drizzling over some olive oil I popped it into the oven or about an hour on a low heat to soften and roast the veggies, letting the spices in the za’taar mingle. 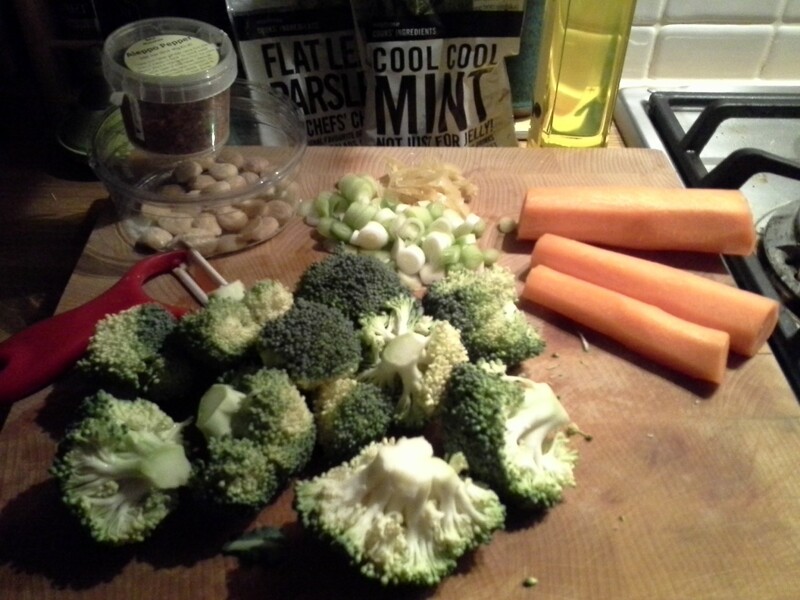 I then slid the veggies into the food processor, adding a little water to loosen the mixture, and blitzed. The soup was then ready for reheating in a large saucepan, with a little veggie stock added to get it to the consistency I like. The bread was from Gail’s bakery which you can buy in bigger Waitrose branches and was a lovely change from the usual. The whole lunch was alto better than the football result…. For dinner I really fancied some chicken, and in particular some Middle Eastern inspired chicken. So…. This lovely free range chicken was marinated for an hour in Aleppo pepper flakes, sumac, olive oil and a squeeze of lemon juice. 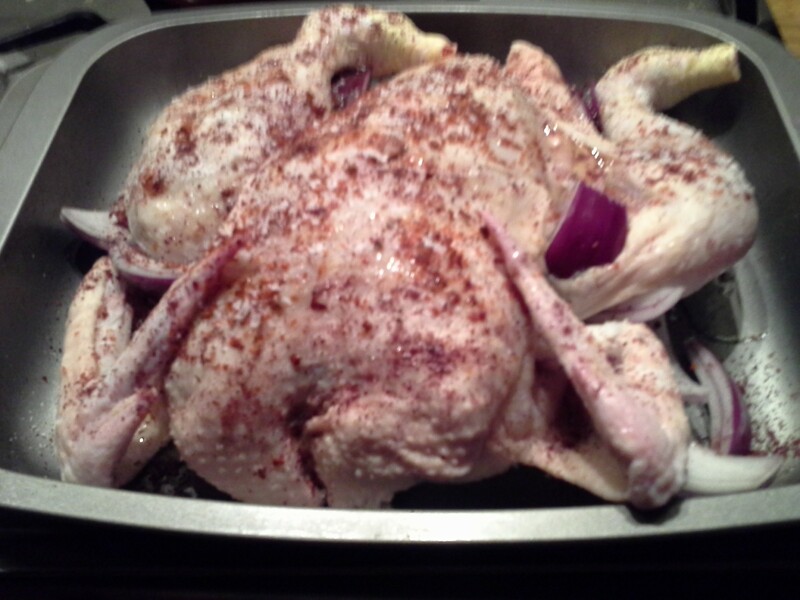 It’s sat on some red onion to make a lovely gravy. Roasted in the oven for about an hour, it had crispy skin, juicy flesh, and lemony, spicy juices to pour over- a kind of jus! We always love our veggies and Tonight’s were inspired by my Ottolengui cookbooks. Firstly a chargrilled broccoli little number: broccoli was boiled briefly until softened but still crisp. I then heated a little olive oil in a griddle plan, added a little garlic and chilli flakes before adding the broccoli and charring. 1 min before serving I tossed in a handful of Marcona salted almonds which added an amazing contrast on textures, and seasoned it perfectly. Secondly I made a gorgeous carrot salad. I chopped the carrot and boiled until almost done. I then left them to cook to a warm room temperature. To these lovely little orange coins I added some chopped salad onions, 2 small preserved lemons chopped up, some olive oil, a little squeeze of lemon juice and 1tsp ras al hanout. All tossed together ready for the chicken. …and of course some roasties for Colin! We woke up on Sunday to find a blue sky so made the most of it by walking along the river to Richmond for lunch. Coming towards us were runners taking part in some 15k run- we were full of admiration as we made our way to the pub!?! It is always at the time of walking along the river that I am reminded how much I love to live where we do, how lucky we are to live in such a beautiful part of the country. For lunch it was a proper Sunday lunch: pork for me and beef for Colin, lovely gravy, well prepared veg, and crispy crackling for me. The venue was The Duke (@TheDukePub2) in Richmond. It was the first Sunday lunch we have had here and it was lovely. We have been here before and found the food to be very tasty. The only gripe I would have would be the number of small children there- the noise level at times was high! Space was found for dinner and a little spaghetti was made. What a lovely weekend. Let’s hope it’s not so long until we can have a weekend off again! However, some lovely food has been consumed in the French Thomas kitchen throughout the latter part of September and beginning of October. There was even a veggie week, some of the best roasties as well as the usual favs, and plenty of red wine! Inspired by the new Nigel Slater book, Eat, I was drawn to all of his older titles and remembered a gorgeous onion and cheese tart. Tonight’s version saw me slice 2 red onions and cook them down in a little olive oil for 15mins or so until thoroughly softened. 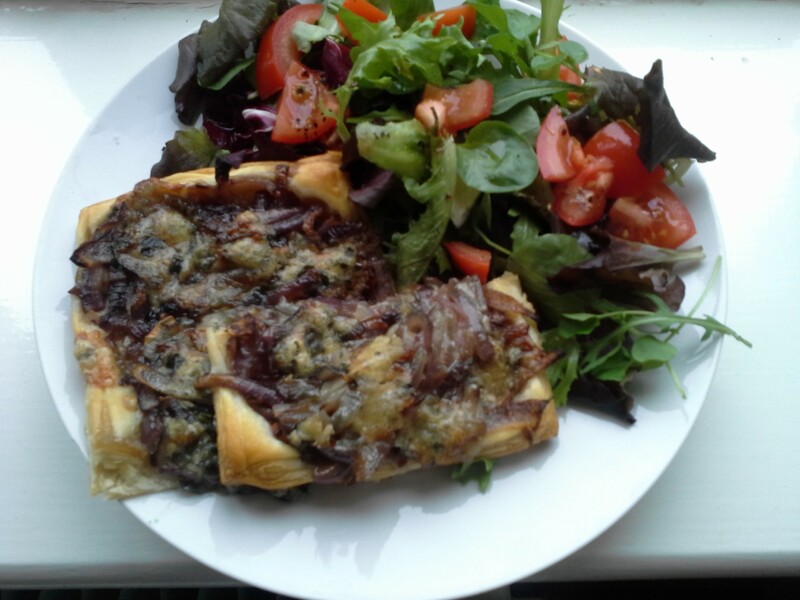 After adding some fresh thyme I popped the mixture on top of the puff pastry, crumbling over some strong blue cheese, and baking in the oven for 15 mins. With loads of salad leaves dressed with a sharp lemon dressing, this was a gorgeous and tasty lunch for Jo. 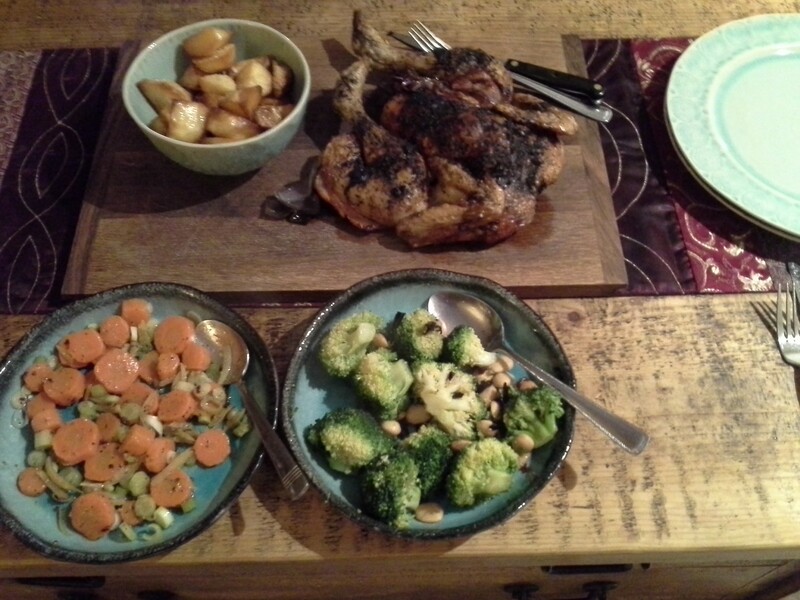 Dinner was a coq au vin: lovely with crispy, crunchy roast potatoes. Tonight I am home alone. Colin is stocktaking- 2nd one this year due to changing jobs (massively bad luck!!! ), so I am waiting for the call to see if my chauffeur service is required. These juicy prawns became my delicious dinner. 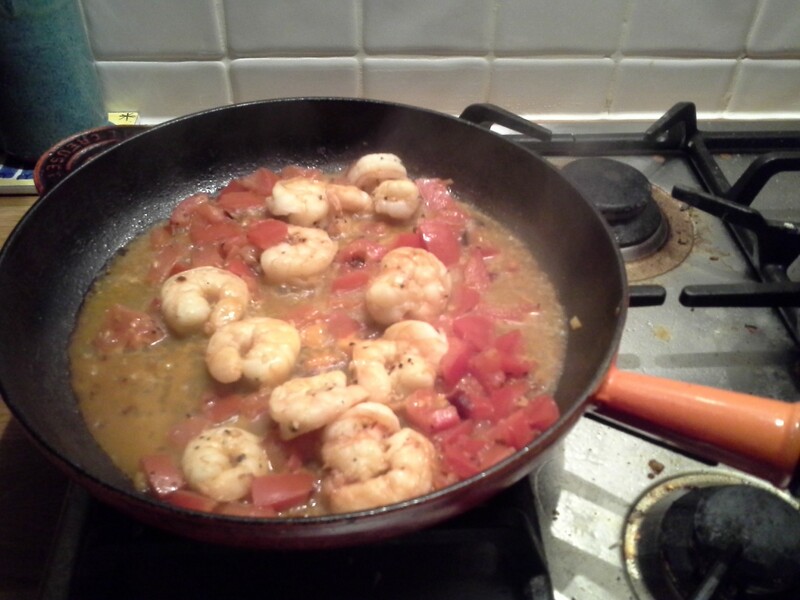 After sautéing a little garlic and chilli in olive oil, I added the prawns until they were cooked through. Then I added a splash of marsala, cooking down before adding tomatoes, then reducing for 10mins until all melded together. Mixed in with some spaghetti this was a lovely dinner for a Jo on her own. Over the last couple of weeks a great thing happened- Whole Foods opened in Richmond! I have visited twice in one week which may sound excessive, but the place is filled with such yummy delights that it could prove addictive. In particular the macaroons are adorable, and the mini lemon meringue tarts are cute and delicious. My bank balance may suffer…. 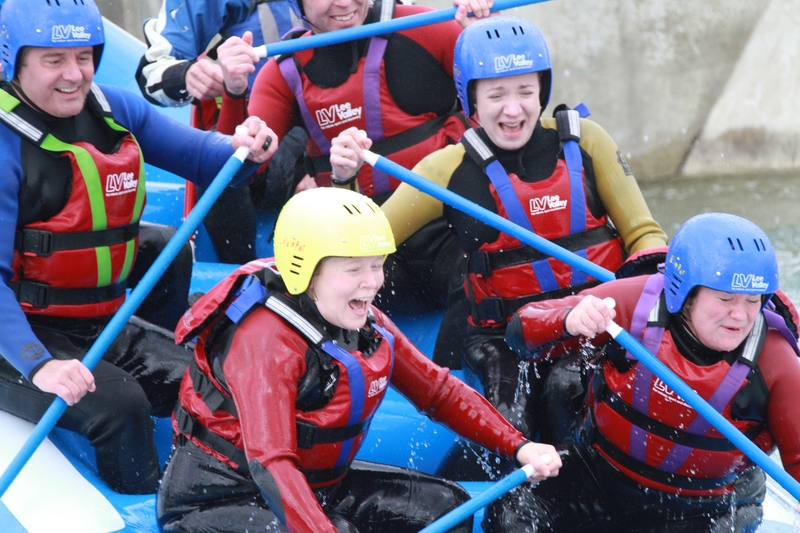 And also for a laugh here’s me white water rafting….. my body is still aching!